Cosmological and astrophysical observations based on gravitational interactions indicate that the matter described by the Standard Model of particle physics constitutes only a small fraction of the entire known Universe. These observations infer the existence of Dark Matter, which, if of particle nature, would have to be beyond the Standard Model. Although the existence of Dark Matter is well-established, its nature and properties still remain one of the greatest unsolved puzzles of fundamental physics. Excellent candidates for Dark Matter particles are weakly interacting massive particles (WIMPs). These “invisible” particles cannot be detected directly by collision experiments. At the LHC, most collisions of protons produce sprays of energetic particles that bundle together into so-called “jets”. Momentum conservation requires that if particles are reconstructed in one part of the detector there have to be recoiling particles in the opposite direction. However, if WIMPs are produced they will leave no trace in the detector, causing a momentum imbalance called “missing transverse momentum” (ETmiss). However, a pair of WIMPs can be produced together with a quark or gluon that is radiated from an incoming parton (a generic constituent of the proton) producing a jet which allows us to tag this kind of events. The jets+ETmiss search looks at final states where a highly energetic jet is produced in association with large ETmiss. Many beyond the Standard Model theories can be probed by looking for an excess of events with large missing transverse momentum compared to the Standard Model expectation. Among those theories, Supersymmetry and models which foresee the existence of Large Extra Spatial Dimensions (LED), predict additional particles that are invisible to collider experiments. These theories could give an elegant explanation to several anomalies still unsolved in the Standard Model. The combination of data-driven techniques and high-precision theoretical calculations has allowed ATLAS to predict the main Standard Model background processes with great precision. The shape of the ETmiss spectrum is used to increase the discovery potential of the analysis and increase the discrimination power between signals and background. The figure shows the missing transverse momentum spectrum compared to the measurement with the Standard Model expectation. Since no significant excess is observed, the level of agreement between data and the prediction is translated into limits on unknown parameters of the Dark Matter, Supersymmetry and LED models. In the WIMP scenario, the latest analysis using data collected in 2015 and 2016 in a specific interaction model are able to exclude Dark Matter masses up to 440 GeV and interaction mediators up to 1.55 TeV. Under the considered model, these represent competitive results when compared with other experiments using different detection approaches. 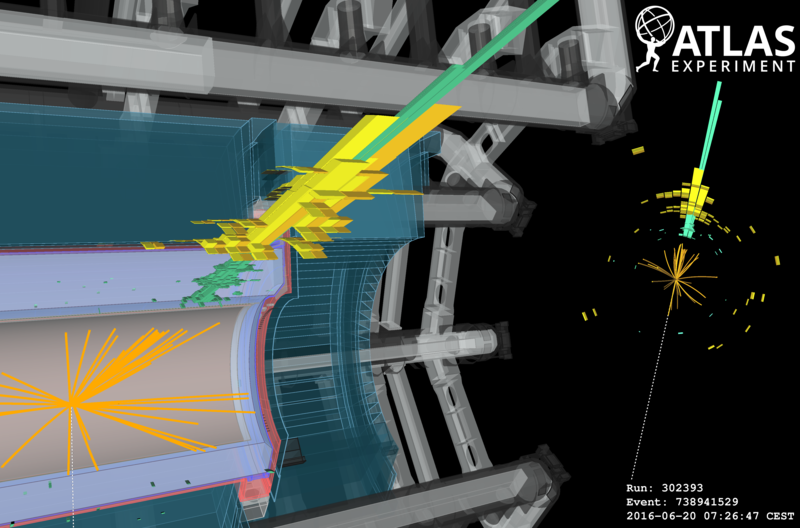 Over the next two years the LHC aims to increase the data available by a factor of three. This will be a unique opportunity for ATLAS to investigate the energy frontier and the jets+ETmiss channel will continue to hold the potential to profoundly revise our understanding of the universe. Search for dark matter and other new phenomena in events with an energetic jet and large missing transverse momentum using the ATLAS detector (ATLAS-CONF-2017-060). EPS 2017 presentation by Shin-Shan Yu: Dark matter searches at colliders.